Enjoy high definition digital movies , music & photos on your hull HD TV with buffalo's LinkTheater™ ! Designed with HDTV screens in mind, it can adapt video content up to a 1080i resolution. 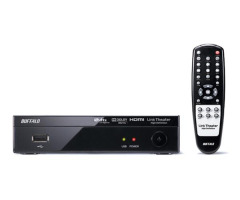 It includes networking via Ethernet connection, digital audio output, aUSB port to directly connect your media files on your USB storage device, HDMI and Composite video outputs, and the ability to natively play an array of the latest audio/video formats. It will stream multimedia content from a Windows PC, aNetwork HDD , USB storage devices, or any DLNA-CERTIFIED™ media server device.